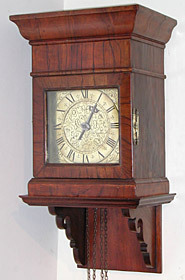 Early 18th century lantern clock by John Calver of Woodbridge (born 1695 - died 1751), converted later to eight-day double fusee movement chiming ting-tang quarters on two bells. Temporary picture before restoration. SOLD. Tiny (six-inch dial) single-handed hook-and-spike wall clock (with alarmwork currently incomplete), anchor escapement made in the mid eighteenth century, signed behind the dial Phillip Mathews, pictured unrestored. SOLD. 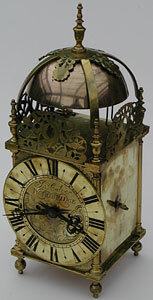 Lantern clock of the 1670s by John Lowe of London, apprenticed 1653, working 1660 to 1683. Originally with balance-wheel escapement, later converted to improve timekeeping, as they all were, in this case to anchor escapement (after cleaning). SOLD. 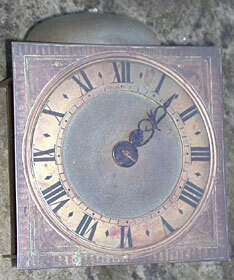 Lantern clock by James Delaunce of Frome, Somerset, formerly centre verge escapement converted later to anchor, pictured before restoration. SOLD. 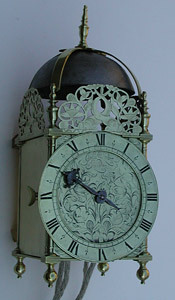 Unrestored lantern clock c.1655 by Thomas Loomes of London. 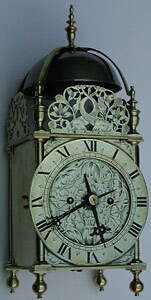 Unsigned hooded clock of the later seventeenth century with unique movement. See article A Tulip-dial Clock of the Seventeenth Century. SOLD.